Nowadays Rupee movement is the most takable topic than sensex these days. When looking in to the technicals still the long term buy signal in rupee is not yet over and keep continuing. Just see the charts presented here. 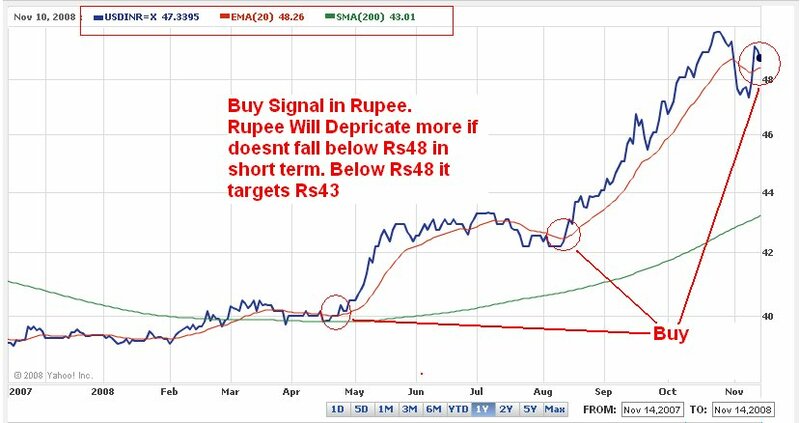 The first Buy signal comes in the rupee when the rupee breaches 200 day MA also moves above 20 day EMA near Rs42. Normally if a stock/index/currency if breaks 200 day MA in upside suggest a long term rally and a fallout below 200 day MA suggests bear hugs to the corresponding stock/index/currency.